That’s Thomas J. Watson, who served as chairman and CEO of IBM between 1914 and 1956. He’s not to be confused with Tom Sturges Watson, golfer, and eight times Major Championship winner between 1975 and 1983. Oh, by the way, Tom Watson the golfer won five [British] Open Championships during that nine-year period. And each of his wins were played at different venues…. Anyway, back to Thomas J. Watson…. And his “out there” statement. Accordingly, I’d like to be thinking there are only six different types of dental practice-owning dentists. Putting it simply, these guys don’t know what they don’t know. They turn up day after day, going through the motions. On the main part, their dental lives are at best, ordinary. They just keep going through the motions…. These guys think they know best. After all, what could be so difficult about improving your business? “Advice is for weaklings”, they say. And these guys are not weak. They know it all, and they can fix anything. Dentists Who Source Information From Multiple Sources And Take No Action. They’re at every possible conference, learning new techniques and skills. And then they go back to their dental practices and put all their course notes right up there on the shelf in their office beside all of the other notes from all of the other courses they have attended. Information that’s been heard and never acted upon has the same value as information never heard. Dentists Who Source Information From Multiple Sources And Take Eclectic Action. These dentists are there in the front row of most seminars each weekend taking copious notes. And then on the Mondays, they’re back at their dental practice implementing the latest changes they need to put into action based on the information they’ve just heard. And often it’s information that conflicts with previous information? Or it’s a new technique learned that’s more exciting than other procedures they’ve been doing. In which case the other procedure gets discarded and rejected, just like an old faithful toy might be tossed in the corner when a new Buzz Lightyear arrives? These dentists know they have areas of their dental practice that need improvement. So they hire a coach or consultant for their practice, and put that coach to work on their dental practice team. They position the poor old coach as the bad guy in a good-guy:bad-guy relationship. Any success they achieve is in spite of themselves. And it is occasional at best. These dentists know the answers lie beyond themselves. They know that they don’t know. And they want to know what they do not know. They do know that there is a better way. And that others have travelled that road…. And those others are willing to share their knowledge about what to do and what not to do. These dentists know that sometimes moving forward can be a leap of faith. But they know that nobody ever made progress by standing still. And these dentists are willing to “trust the force”. Which dentist are you on this spectrum? Take a look at all of your relationships out there and tell me one thing you see that they all have in common? We all prefer to associate with people we like rather than people we do not like. Life would be pretty darn miserable if we were forced to socialise and do business with people we do not like… I think that’s called prison. Years ago, I used to buy my newspapers and magazines at my local newsagency, which was a short fifteen minute walk from my home. There was an employee working there at that newsagency named Bob, who always made me feel welcome, and who was a pleasure to see each day. Sadly, when Bob left there, the owner of the shop and his daughter, who were both as abrasive as two pieces of course sandpaper, took over the cashier and service roles. Suddenly everything that was asked of them by customers became too difficult for them. With Bob, on the other hand, nothing was ever a bother. Bob excelled in making the impossible possible. Thanks for the unasked for philosophy lesson…. And there ended the customer-shopkeeper relationship. What does this all mean to dentistry? And people choose not to do business with people they dislike. From that point on, it was more inconvenient for me to have to travel further to buy my magazines and my newspapers. But there was no point in rewarding rudeness. Do you have abrasive employees dealing with your valued customers? Do you know what’s being said by your staff members to those trusted and loyal patients? In 1998 I advanced the employment opportunities of a long-term dental receptionist. And replaced her with one of the best employees I ever had, who immediately closed the EXIT DOOR of unhappy patients who were being rubbed up the wrong way by the previous employee. The conga-line of offended patients exiting the dental office disappeared. Years later we employed an additional front office employee who was very efficient and skilled at what she needed to do. Problem was, *SMILE* was not part of her vocabulary. In your dental office, you need to employ “people people”. One of the things that surprises me when I talk to dental practice business owners is how little emphasis they put on profit. Most of the time I find their core beliefs are based on being busy. Most dental owners believe that if there’s plenty of gross coming in to the dental practice then at the end of the day, the end of the month, the end of the year, there’s bound to be some net around somewhere. Which is a total fabrication. Because if there’s no profit, or worse still, a loss being made by the business on a procedure, then doing more of those procedures will only multiply those deficiencies. One times zero is zero. And one hundred times zero is still zero. And one times minus ten is minus ten. While one hundred times minus ten is minus one thousand. Don’t be tricked into doing procedures just for the sake of doing them. One of my clients in the USA worked out that the fees being paid to her by the government for some dental procedures were less than what she was spending on staff and laboratory costs in delivering those procedures. When she started sifting out these loss-making procedures, she soon worked out that she was better off not accepting any government “plans” at all. She removed her dental office from those plans, sacked over 1500 patients, and her annual collections went up by over $220,000.00, or 20.56%. Because she now had freed up a whole pile more available time to be seeing patients who valued what she could do for them and were willing to pay her to do so. Another dentist I knew removed his dental office from an insurance company plan, and in so doing his collections for the year dropped forty percent. What he found was that his net profit for that same year rose by twenty percent! What this means was that he was subsidising the procedures being performed on those patients with THAT company’s insurance, without really realising that this was the case. In both these cases, these dental offices saw less patients as a result of this rationalization, and yet their bottom lines grew significantly!! Thirdly, I’ve seen dental offices where there are multiple treatment rooms and multiple associate dentists employed. 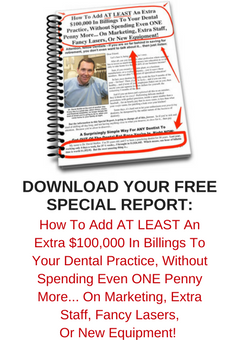 And in a lot of these cases, the practice owners ARE NOT making a profit and are indeed making a loss because the associate dentists are under-diagnosing, under-presenting and under-treating their patients, and too slow, while they take up valuable practice resources of staff, staff time, and equipment. These offices would be far better off if they removed these slow-speed associate dentists and went back to simply treating patients, as opposed to window-dressing their practices with multiple associate dentist brass plates. I once had an associate new-graduate dentist who I employed and mentored in my dental office for twelve months. Each week I would meet with her for one hour to discuss her patients. What I worked out was that the revenue that my practice was keeping as a result of her being there was less than the revenue I would have collected if I had simply seen patients myself during that hour that I spent mentoring this dentist. I really needed to give myself an uppercut…. At the end of the day, when the banks come knocking on your door wanting their money back, your historical stories of compassion and mentoring will mean “not much” as they toss you out of your home and lock you out of your under-performing dental office..
And that’s the harsh reality. Coupled with this, as you push your shopping trolley of your soiled worldly possessions away towards the nearest underpass where you can shelter, be sure to make sure you keep count of all of those patients who you gave discounts to over the years, who come forward to offer you financial support during these times…. The Four Things We Must Achieve When Providing World Class Customer Service In Our Dental Practices. In the process of providing World Class Customer Service in our Dental Practice, our goal should always be to achieve as many of these following four outcomes as possible for our patients. If we fail to achieve one or more of these outcomes, then we create an opportunity for our patient to feel underwhelmed with our lack of attention towards them. And that is a negative result for our dental practice. New patients are expensive to acquire and are also expensive when we fail to keep them after attracting them. You see, the lost patient has cost the practice money in advertising to attract them, as well as lost time in processing their making of the appointment along with their keeping of the appointment. On top of this, there is also the lost effort spent getting familiar with the new patient, getting to know them, as well as making them feel relaxed and at ease with our dental office. Make the client feel welcome. A new patient is a first time visitor to our dental office. The feeling that we are trying to impart upon the new patient is the feeling of “home”. We want the patient to feel as if they have been welcomed into the home of their best friend. The patient should be made to feel as if we have been waiting all day just for them, and that we have SO been looking forward to their visit. The new patient should never be made to feel as if they are an intrusion. The offering of creature comforts that allow the new patient to feel “at home” is so important. We don’t want the patient to feel as if they are waiting on “Death Row”. Do we have the ability to offer the new patient a beverage? Can we offer them a pillow, or a blanket? Or a book or a magazine? Or are we able to simply sit down beside them and have a good old chat with them and take their mind off their upcoming dental treatment? Make the client feel important. Our goal should be to make the client feel as if we have been waiting on their visit all day, and that we have been so looking forward to meeting them. Our aim is to make the new patient feel as if they are the only person that we have wanted to see all day. Our aim is to have the new patient feel that they are the only patient at our dental office during their visit, and that we have all the time in the world to spend with them, and they have our undivided attention. Make the client feel understood. All that anybody really wants is for someone to listen to them and to understand their situation. And it may not be all about their dental situation. They may simply want somebody to understand how they are feeling. And that could be how they are feeling about events not related to their visit. It is said that small children spell the word “LOVE” as T.I.M.E..
And amazingly, adults will spell it exactly the same way. Take the time to understand each of your patients. You’ll certainly be rewarded for “spending the time” to do so. If you and your team make the effort to implement the necessary systems that enable your office to consistently exceed the client’s expectations and make them feel welcome, comfortable, important, and understood, you will keep more new patients. Your success will be guaranteed. Are You Counting Or Guessing Your Dental Practice Numbers? I have a dentist client who is right on top of her numbers. On the pulse of her business. Each day she knows how her business is going compared to last year at that same date…on a Year-To-Date basis, as well as on a comparison on a day-by-day basis monthly, compared to the same month last year as well as to the previous month just gone. She knows exactly how things are going and where things are at in her business. She’s on top of her New Patient numbers and her Google Review numbers on the exact same comparisons…. Not many dentists are abreast of their numbers. For a lot of dentists, their practices are built on hope. You cannot hope for better numbers. You need to WORK for better numbers. If you do not know EXACTLY what your numbers are EXACTLY, then how can you ever be able to improve on your position? It’s like travel…. how can you ever work out your best route of travel if you do not know exactly where you are starting from? But so many dentists just WISH for things to get better. I know another dentist who has achieved a very lofty monthly production goal twice in the past five months, and has been very proud of the fact. But for the other three months, the practice productions have been, let’s say, “inconsistent”. And I’m more interested in the different reasons that underlie this inconsistency, and fixing those reasons, so that the practice performs with consistent predictable regularity. Because, while it’s alright to be celebrating your wins, what’s not alright is to be scratching around trying to make ends meet on other occasions. I’ve lived in both unpredictable and predictable times, and having a consistent, predictable business is much less stressful during those unpredictable times. You CAN have a predictable business with a predictable income. And heck, if I can do it, then you surely can do it too….